Everyone hates political signage.... or do they? We decided to have a little fun and run a survey to find out more about our hatred or love of political signage. Check out to see some of our results! Original Request- Would love to have another one of the custom metal Army fight songs cut for my husband to hang in our house. Aluminum vs Stainless Steel: Which is Better for Your Metal Sign? Metal signs speak volumes. Their sturdiness, malleability, and sleek finish add a level of finesse to business signs. Making the best decisions about the design of your business’ sign shouldn’t be your sole consideration. The type of metal used also plays a major role in how long it will last in external weather conditions. Aluminum and steel are two of the best metals to use in metal signs. The table below compares both types of metals so that you can make an informed decision about the best metal to use for your sign. Aluminum has a tensile strength of 276 MPa and a density of 2.81gcm-3. Aluminum is, therefore, lighter than steel. Stainless steel has a tensile strength of 505 MPa and a density of 8 gcm-3. Steel is, therefore, stronger than aluminum. Aluminum has a passivation layer that helps it resist oxidation and corrosion. Stainless steel contains chromium which has corrosion resistance properties. Aluminum is more expensive than steel. Steel is less expensive and completely recyclable. Aluminum is more malleable and elastic. Steel is less malleable and elastic. Steel is one of the poorest conductors of electricity amongst all the metals. Aluminum is more difficult to weld than steel. Steel is less difficult to weld than aluminum. Aluminum is a better metal to use for outdoor signs because it has better weather resistance than steel. Steel, however, has superior strength. So, if you’re comfortable with rust developing on your sign overtime in favor of something stronger, steel is your best option. Both metals can be used for indoor signs. Essentially, the choice you make depends on what you’re willing to live with. Both metals will give you the refined look you desire. Their strength and weather resistance are the ultimate decision factors. Color enhances everything. It helps you tell a story without having to use words. Custom metal signs sometimes need pops of color to send the right message for the intended audience. However, according to Corky Binggeli and Patricia Greichen, authors of the book Interior Graphic Standards, “Color choices for sign messages, backgrounds, and graphics should be chosen to ensure adequate contrast and legibility.” They further state that signage guidelines dictate “a 70 percent contrast ratio of message to background.” Therefore, while colors for custom metal signs should complement the space they’re in, they should also use contrasting colors. This article presents some guidelines for choosing the right colors for your metal sign. The color wheel acts shows the relationship between colors. Contrasting colors are found in different segments of the color wheel. Yellow, for instance, is in the warm portion of the color wheel while purple is in the cool portion. Jacci Howard Bear in an article entitled Contrasting Colors published on thoughtco.com states that “Colors don’t have to be direct opposites or have a set amount of separation to be considered contrasting or complementary. In design, it’s more about perception and feeling.” Therefore, you don’t need to stick to the rule of contrasting colors being on the opposite ends of the color wheel. You can work with colors that you think go well together, but using the color wheel as a guide can be very helpful. Paul Arthur and Romedi Passini crafted an ingenious method for determining the right colors to use in signs. They documented it in their book Wayfinding: People, Signs and Architecture. They created a table of light reflectancy readings in percentages. These readings are used to calculate the brightness differential. A brightness differential of 70 percent or more guarantees greater legibility. Color combinations with a brightness differential less than 70 percent shouldn’t be used. The light reflectancy table is shown below. Let’s use white and purple as an example. Therefore, this color combination can be used. In this case, a dark purple would have to be used against the white background so that the words stand out. Choosing the right color combination for your sign can seem like a daunting task. A consistent brand will use the company’s colors in all areas of branding, including signs. 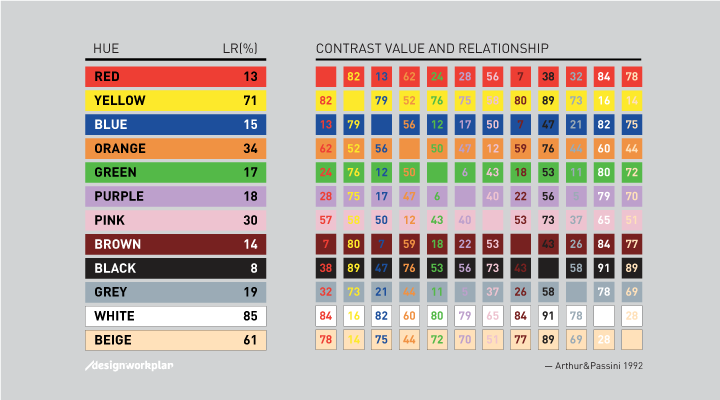 The trick is to ensure that you have the right color combinations for your brand from the get-go. The team of sign experts at ShieldCo can create an impactful metal sign in any color combination you choose. Call or email us today to schedule a free consultation. Need a sign? Click the Free Quote button below! Custom metal signs add character to any space. The malleability of the metal makes it fairly easy to shape it into any desired shape or pattern. Metal signs don’t have to be limited to the conventional words with a little logo attached. They can be taken to new dimensions with the right artistic mind. Some examples are shown below. Why is wall art important in interior design? Interior design is more than just choosing the right furniture, fluffing a few pillows, and painting some walls. It should be treated like an art form, worthy of the same type of attention painters give to the most minute details in their work. Wall art, believe it or not, is an important part of interior design. The benefits of making wall art a more prominent consideration in your interior design plans are detailed below. Even metal wall art can be used to inspire your color choices for a room. The pictures above show that it is possible to have wall art that is either purely metallic or has a combination of colors. If a variety of colors are present, choose the dominant color and shades you can use as accents. These are the colors that you’ll use to decorate the space. Decorating in this way will help you creating a unified design. Wall art, when used correctly, creates a focal point around which the entire design is based. It gives visitors a sense of what to expect from the space. Size is, therefore, an important consideration. A metal piece that is too small will look small against the surrounding furniture. Contrastingly, a metal piece that is too big will be too prominent in the room. Take wall measurements to ensure that your metal wall art utilizes the right amount of space. Wall art that incorporates a variety of media adds texture to a space. The depth these pieces add will determine the tone of the room. Rough textures add intimacy to a space while smooth textures add sleekness. Metal signs can become works of art. An expert at ShieldCo can help you create a metal sign piece that is perfect for wall art. Contact us today for a free consultation. Geometric patterns are a growing trend in interior design. Their sharp edges and bod shapes add a level of intrigue to a space that other design elements often can’t provide. Custom metal signs provide one of the best opportunities to create geometrically intriguing wall art for interior spaces. You can even put your business’ name and logo against a fun geometric pattern. Reasons for geometric designs being meaningful in interior design are highlighted in this article. Entering a space that only has paint on the walls can be pretty boring. This is especially true when there are no pops of color in the space. Office spaces tend to shy away from using color because businesses don’t want to overwhelm customers. Adding a geometric custom metal sign can add just the right amount of interest to a seemingly dull space. Geometric wall art sometimes forms a part of the golden ratio of proportion in interior design. The most commonly used ratio is: 60 percent neutral colors, 30 percent darkly colored furniture, 5 percent accents in warm colors, 5 percent accents in bright colors. Geometric custom metal signs can be used as accents in a design. A design accent doesn’t play a prominent role in the design, but helps to break up the space. Shapes of design elements can influence the layout of a space. Custom metal signs used as wall art can inspire a pattern and theme for a room. A designer can choose to use the sign’s pattern as inspiration for the way the furniture in the room is arranged. Another option is to use the sign’s colors to influence the color choices for the space. Geometry plays an important role in sign design. The geometric patterns that are used in metal signs can inspire the design of the entire space. The team at ShieldCo can help you determine the right geometric shape to use for your business’ interior custom metal sign. Contact us today for a free consultation. Metal signs are already stunning on their own. Their vibrant finishes, bold lettering, refined edges, and perfect color blends result in a sign that truly makes an impact. That impact is greatly diminished, however, if the appropriate lighting isn’t used. Illuminated signs have numerous benefits and shouldn’t be overlooked. This article highlights some of the most important benefits. On-premise signs are one of the most cost-effective forms of advertising. A well-built sign may seem like a huge investment initially, but it is an investment that does pay off in the long term. In fact, a study conducted in 2011 revealed that most mobile customers who shop on impulse stopped at fast food restaurants because they saw the restaurant’s sin while driving past. The marketing impact of a business sign is non-existent if the sign can’t be sign. Your beautiful metal sign is practically invisible at night or in poorly lit conditions. Illumination using LED lights, or other lighting options, solves this problem. People won’t miss your sign in these conditions if it is well-lit. Simplicity works in your favor when creating a business sign. Simple typography and a legible design are crucial. Think about the Crate and Barrel sign. It is literally the words “crate and barrel” running along the building. Lighting enables you to add some extra oomph to such a simple sign design. You can use LED lights to add strong pops of color. You could also use halo lighting to make the sign glow. There are some interesting lighting tricks that you can play with LED lights. Angling the lights in various ways to cast shadows in the right places can help you make a dramatic impact. There are other tricks that you can also discuss with lighting experts. What type of lighting should you choose? · They don’t contain harmful gases. Neon lights contain mercury which is harmful to the environment. · They use less energy. · They don’t need to be replaced regularly. A well-lit sign adds tremendous marketing prospects to your business. It makes your business easy to find in poorly lit conditions and allows you to add some interesting design elements without changing the entire sign. Speak with a ShieldCo representative today to find out how we can add lighting to your custom metal sign. Urban wayfinding has several components. Good urban planners pay attention to all of these components and work assiduously to make them work in harmony. Each component uses the right colors, typography, shapes, logos, materials and nomenclature. If you are an urban planner, ensure that you use the right types of signs for each of these areas so that people who visit your area can navigate easily. City, regional and district gateways are the first places that should have well-built signs. People should know when they are both entering and leaving these major areas. Both the entry and exit signs should follow the same format and have the same type of look and material. Signs for city gateways can be freestanding or attached to other landmarks including bridges, buildings and parks. District gateways can include cultural districts, commercial districts, or political districts. The point is to make these areas easy to identify. Vehicular wayfinding signs are along roadways and direct motorists to districts, cities, parks, heritage areas, destinations and parking. Visibility at high speeds is a must. Vehicular wayfinding signs fall into 3 categories: Controlled Access Road Signs, Regional Signs, Large Scale Signs and Downtown and Neighborhood Signs. Controlled Access Road Signs direct motorists to destinations along highways. They must follow Federal Highway Administration guidelines even though they are administered by individual states. Regional Signs guide motorists to parks, agricultural facilities, institutional and commercial destinations, and heritage areas outside of urban areas. Distance is typically included on these signs and they are administered either by state bodies, counties, or a combination of counties and towns. Large Scale Signs direct motorists to large scale destination and urban districts. Finally, Downtown and Neighborhood Signs direct motorists to localized destinations and parking. They can also direct motorists back to interstate and state roads. Pedestrian wayfinding signs help pedestrians navigate within a district or neighborhood. There are three types of Pedestrian Wayfinding Signs: Pedestrian Directional Signs, Map Signs and Directories. The names are self-explanatory. These signs characterize destinations. There are 5 types of Destination Identity Signs: Institutional Identity, Gateway, Interpretive Identity, On-Premise Commercial Landmarks, and Parking. Institutional Identity signs clearly identify government, cultural, educational, transportation or health buildings. Gateway signs are often placed at the entrances of educational, corporate, transportation, and healthcare locations. Interpretive identity signs require some form of interpretation. On-Premise Commercial Landmark signs clearly identify commercial or corporate offices and also serve as landmarks. Parking signs identify parking areas within the district. These signs include: street signs, regulatory signs, street furniture, public art, civic banner programs, and visitor centers. Media and print support integrates physical elements, websites, mobile media, print maps and directories with tangible urban design elements. ShieldCo designs custom metal signs that would be perfect for your state, county, or urban district signs. Contact one of our representatives today to get a quotation for your specific needs. Signs aren’t limited to storefronts and interior retail spaces. They are also important elements in urban landscapes. Busy commercial districts, parks, playgrounds and other urban areas typically have signs that perform various roles. Understanding their importance will probably make you take a second look at these signs that you see every day. This article focuses on 5 reasons for the importance of signs in wayfinding in urban areas. The ability to identify exactly where we are is extremely important. Street signs follow specific guidelines stipulated by state and federal laws and help us identify the specific names of streets . There are other signs, however, that can help us identify locations. Municipal wayfinding systems generally identify destinations within a city and provide useful information about each destination. These types of signs create what Kevin Lynch, a popular urban geographer, calls the “legible city”. GPS is both a blessing and a curse. On one hand it helps us easily find unfamiliar locations. On the other hand, it causes us to easily pass by less popular areas that may be equally interesting. A city’s wayfinding program incorporates signs that clearly showcase the museums, retail districts, historical areas, and landmarks that visitors may overlook. A community is a brand. All landmarks, storefronts, business places, and areas of interest within that community should, therefore, create a cohesive image that fits into the city’s brand. Each major American city has architectural standards that must be upheld, promotes the production and display of high-quality commercial on-premise signs, creates distinguishable monuments, and builds mounted identifications and marquees. Additionally, on-premise signage plays a role in real-estate value and business success. Both factors contribute to the overall financial success of a community. Vehicular traffic is a necessary component of a traveler’s commute through a city. Motorists have to be able to easily identify public and private parking lots, road traffic signs, and directions to popular destinations in the city. The movement of traffic also has to be controlled. Appropriate signage is one way to effectively address both areas of concern. Why do I feel overstimulated? How can I know where to go when I can barely see that sign in the midst of the clutter? I’m confused! Cities that create a consistent environment make it easier for a passerby to quickly read and comprehend signs. Urban wayfinding isn’t a job reserved for urban planners. Each person in the community plays a role. Ensure that you research the sign and building regulations of your area before building your space or creating a sign. Make a positive contribution to your community.